1400 hours, 6th December 2017. Around fifty Civic Society members checked-in at Aerospace Bristol. 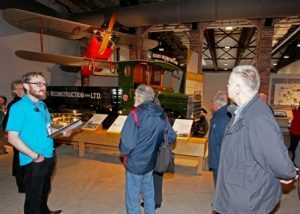 We were scheduled for a conducted tour of the recently-opened £19m aviation museum. It tells the story of the contribution that the aircraft industry has made to our city. You may recall the Industrial Museum (now M Shed) had a collection of aero engines, displayed in a row and labelled with technical descriptions. A dead assembly of objects; hardly celebratory. Fast-forward to a sensitively refurbished WWI hangar flanking the Filton runway. Those engines are here now, with explanatory graphics, alongside flimsy biplanes and a Giotto spacecraft; a Bloodhound surface-to-air rocket, menacingly in its firing position; a complete Sea Harrier jump jet. Fuselages, a tram, helicopters – and a Bristol car, ‘inspired by plans purloined in 1945 from a bombed BMW factory in Munich’, confided Oliver, our guide. We then took a short walk across the tarmac towards a new, anonymous, gunmetal-grey building. Passing through the narrow entrance doors, we found ourselves suddenly beneath the curved beak of a beautiful caged bird – Concorde Alpha Foxtrot. Oliver explained that she was faster than a bullet, faster even than the jet fighters of her day because they had to stop to refuel. Only that sinister Bloodhound missile could draw level . . . Thanks are due to events organiser Nic Billane for booking our supersonic trip. Some of us adjourned for coffee and cake in the café – we needed ground-level sustenance after all that giddy altitude!